In Appendix A, we discuss various equipment and methodologies for accurately capturing data for flows and pressures using both portable and permanent field equipment. However once we have captured the data it is important to properly organize and store the data in a meaningful manner, so that we can be accountable for the subsequent decisions which will be made. 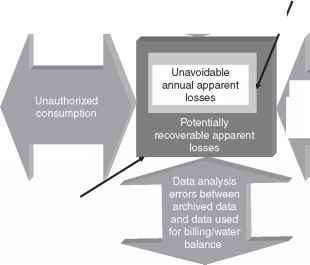 Not all water systems will have all of the data they need for a full audit, however it is better to make estimations and perform an audit than not to do one at all. Lower confidence can be assigned to estimates and higher confidence to measured values. such as Excel work sheets or Access databases, however these products have size limitations, Excel (Pre 2007) can hold only 58,000 rows of information and Access can store only 2 GB of data. In many cases, good accurate data may not be available and the operator will have to make a decision as to whether to use the questionable data or estimations or not. In many cases it is better to do something rather than stop and do nothing. In this case, we should be sure to note that the data was questionable or estimated and the operator's assessment of what should be done to improve this in future audits and how the data should be used this time round. The following section discusses good data management techniques.